My favorite day of the week (food-wise) is the day we eat fish. I love how there are so many ways you can cook it and enjoy the variety of flavors. In my opinion, the best way to eat fish is raw – in order of preference, raw white fish, followed by salmon then tuna- but grilled has its perks because you get to be creative with the sauces and seasoning. 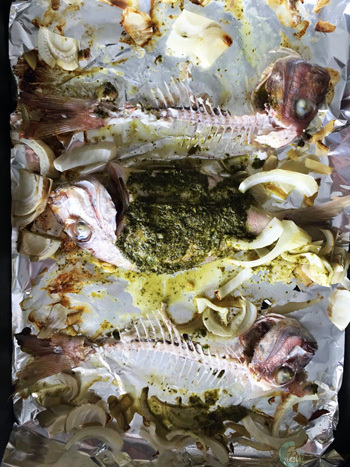 When you’re in a hurry, you can stuff the fish with rosemary leaves and lemon slices, then throw it in the oven and take it out grilled and ready. If you have time however, I greatly suggest you get creative with the seasoning. Last Saturday, we came up with this absolutely lip-smacking sauce to have your grilled fish with. Here’s the recipe. 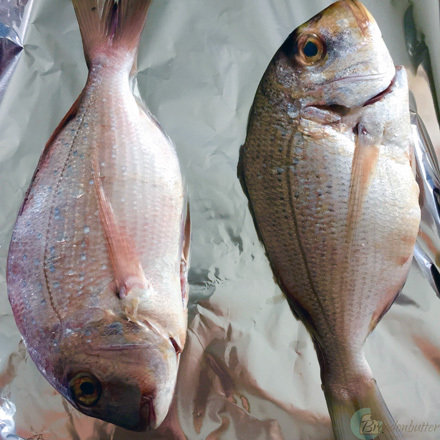 Line an oven dish with parchment paper or aluminum foil and place the fish on top and slice them in some places. In a small blender, place the coriander leaves, garlic cloves and ginger and pulse until they are all chopped and combined. Add half of the lemon juice and olive oil and pulse until combined. Then add the other half of the lemon and olive oil, adding salt. Pulse until combined. 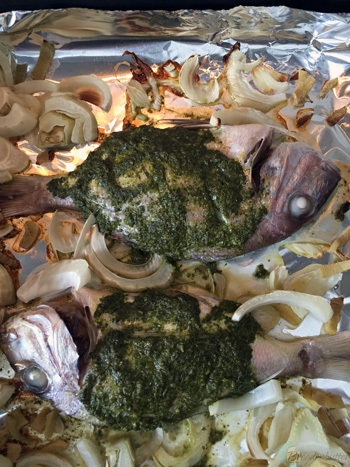 Add half the sauce on top of the fish, place the fennel around it and enter the dish in the oven for around 15 minutes or until the fish are completely cooked. Serve with fresh sauce aside.